How have I never had the wonder that is Country Fried Steak before? Steak... fried... with gravy. Genius. And you know where I had a good one? IHOP, of all places! Cruising around the mall area Sunday morning, I pointed out the two closest brunch spots: IHOP and Friendly's. Groan. But we went with IHOP, because ya know, breakfast is what they do. They should be good at it. And I was surprised to find that my breakfast was awesome! 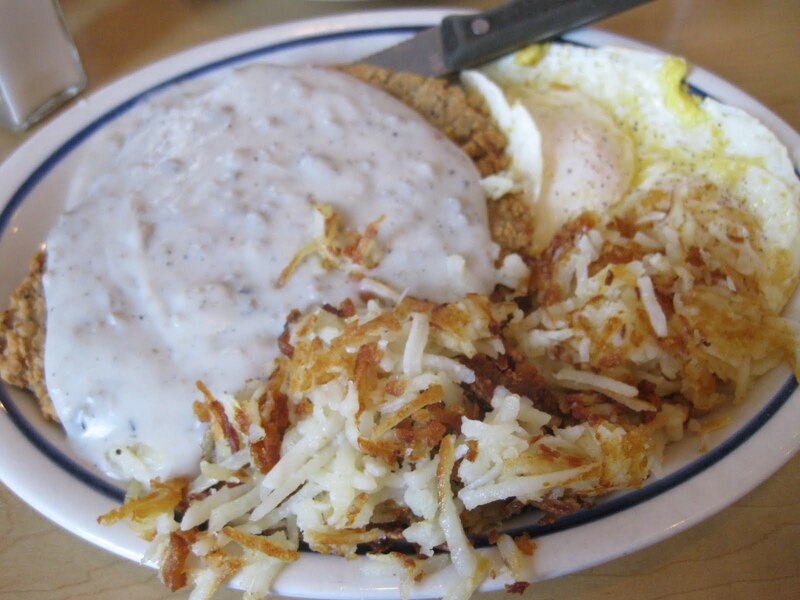 Perfectly cooked eggs, crunchy, crispy hash browns, and the mammoth Country Fried Steak. Peppery, crispy coating, juicy steak, and loads of not-too-salty sausage gravy. Heaven! And did you know that IHOP's menu now contains calorie counts? This new practice almost renders it impossible to order anything except the fruit-filled crepe. I took the opposite tack and went with the Country Fried Steak, which had the most calories- a whopping 1650 of em. Wahoo. And it was worth every calorie-laden bite. I was pretty impressed with the brunch efforts at IHOP. It's an intense eating experience, with all the people watching, children screaming, and the crazy-eyed staff running around bussing tables. But for a 10-minute wait at 10am and $20 bucks, we had our food cooked correctly, our own air pot of coffee, and prompt service. Not too shabby. I am no expert in this matter, but I should think the Cracker Barrel might be worth a try on the CFS front. Considering your love of calories and all. I have never actually been to an IHOP (I know - the horror). I'm constantly forcing my fiancee to go to such establishments (Cracker Barrel and Applebee's included) with me and he always refuses. Too fancy for his own good, ugh. And... now I want a fried steak. gravy for breakfast. what a beautiful reality.